Post the merger, the manufacturing materials for the wind turbine blades changed, meaning that there were more chemicals involved in the manufacturing process. 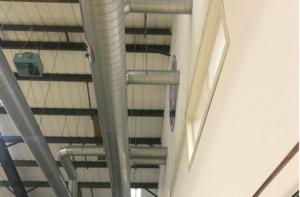 Whilst the team doing the manufacturing itself have protection against these chemical gases, there was a requirement to provide fresher air for the office team working nearby. In addition to this, the offices were getting hot in summer and cold in winter, so there was a requirement for both cooling and heating. Any solution required needed to be not only effective, but also as carbon neutral as possible. LM Wind Power had previously tried other options to cool their offices in summer including small air conditioning units, but they were ineffective in the space and the energy use was far too high. Plus, they did not provide the ‘fresh air’ required for the office team. 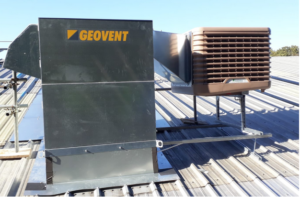 Installers, Vent-Tech proposed that an EcoCooling evaporative cooling unit should be to be mounted on the roof and that it should be ducted into a heat recovery unit positioned on the roof adjacent to the cooling unit. 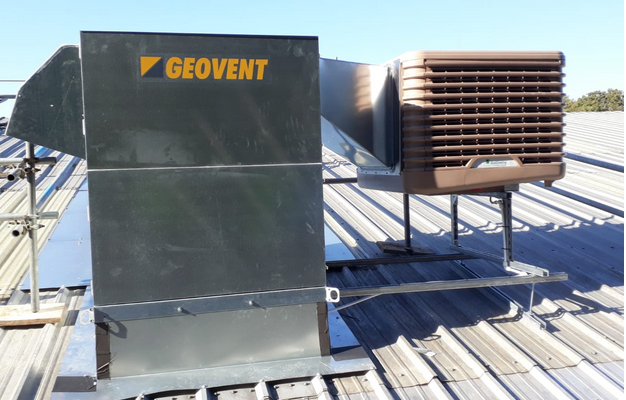 The EcoCooling ECP small unit was selected to provide a completely natural way of cooling incoming air during the summer months, at a fraction of the cost of a traditional AC system. 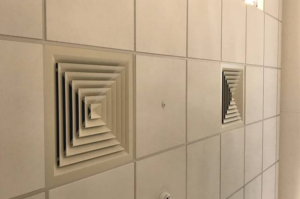 During the summer this means that fresh cool air is ducted into the offices via acoustic lined flexible ducting and 4-way diffuser grilles. There are total of 16 grilles to serve all the office space. The installation took place around the people working on-site with little site disruption, and the system is now up and working properly with the team at LM Wind Power being very happy with the end result. The combination of the evaporative cooling and heat recovery units means that working together with the existing heating system, the offices are able to be kept at a steady 21°C all year, whilst using little energy/carbon. Employees are now able to work in fresh clean air which is being pumped through the building all year, and LM Wind Power has reached their commitment to be a carbon neutral company. For more on the installers, please see the Vent-Tech cooling website. “Vent-Tech – Experts in the installation and maintenance of EcoCooling Evaporative Cooling systems”.